SIGNATURE: Unsigned, annotated in pencil verso. Study of a young boy is a prime example of Sharp’s happy pictures. Here a child is busy drawing the magnificent landscape before him with the bright summer light reflecting sharply off his clothes. Sharp believed colour to be as important as form in the creation of a work and painted quickly with a heavily loaded brush. These ideas and techniques were learnt in Paris where she became influenced by the Impressionists, particularly by Monet. 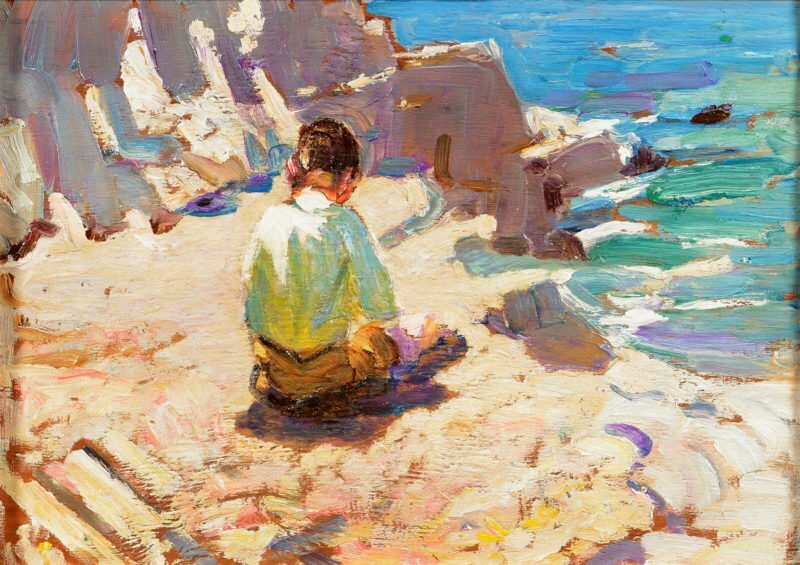 These concepts are perfectly executed in this beautiful painting where Sharp’s thick application of paint and use of exuberant colour palette highlights the bright sea and rocky foreshore. The bright light in this charming painting further reflects her Impressionist teachings. Her pictures have a fresh colour scheme, sense of movement and warmth that fit perfectly with her subjects. In the same way, her mastery of the impressionistic style imbues her canvases with an almost dream-like sentimentality. Dorothea Sharp was born in Dartford in England. She studied at Regent Street Polytechnic school in London under Sir David Murray and en plein air painter George Clausen, before going on to study in Paris. The latter greatly influenced her handling of subjects and colour in impressionist fashion such as her handling of light. Upon her return to London, she became actively involved in the Society of Women Artists in London, exhibiting with them from 1902 on, and at one point became the group’s vice-president. Sharp became strongly associated with St Ives in the 1920s, visiting in the summers and immersing herself in the subject matter she became renowned for, joyful images of children, often at the beach. She took one of the Porthmeor studios which she retained over many years and later moved to. 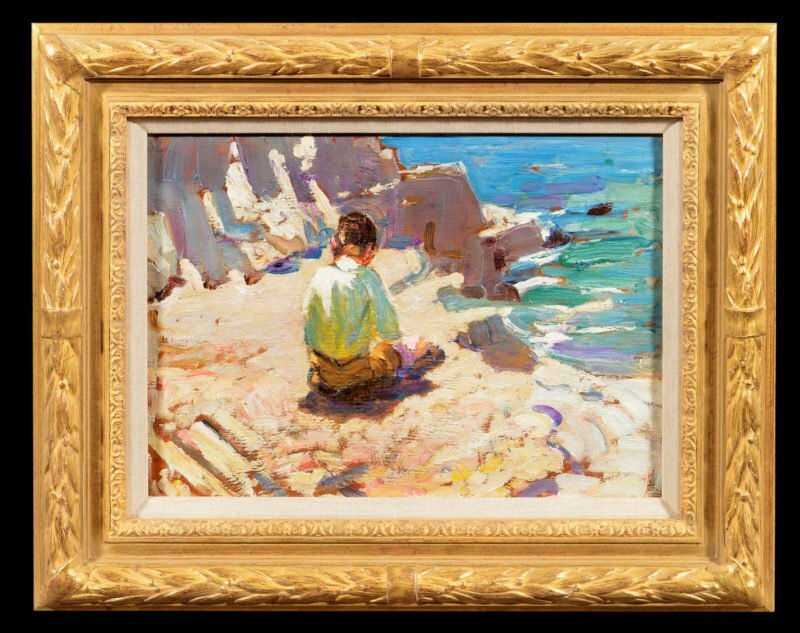 Her training and practice as a plein air painter and her absorption of the impressionists’ use of colour and light brought freshness and spontaneity to her images of children. In 1928 Sharp was elected an honorary member of the St Ives Society of Artists, and in the late 1930s she settled in the colony for several years. Deeply immersed in artistic life there, she showed with such well-known artists as Laura Knight, Alfred Munnings and Stanhope Forbes. For several years she managed Lanham Galleries in St Ives, which showcased the work of Newlyn and St Ives School painters. In the mid-1940s Sharp returned permanently to her Blomfield Road studio in London, where she remained until her death in 1955. Sharp exhibited widely during her lifetime from the Royal Academy through to the Royal Society of British Artists to which she was elected in 1907. The Artist magazine, August 1931, Vol. 1 No. 6, Illustrated on page 224 (A copy of this magazine will be given to the buyer of this work).